The Place Tucked at a corner in Serangoon Gardens, Chillax Cafe seeks to provide its diners a place for them to (well….) chill and relax! So, don’t expect the most pretentious of places, but please feel at ease here, with some decent food and wide selections of both alcoholic and perk-me-up drinks! Having recently revamped their Brunch options, named The Big Brunch Affair, this on every weekends from 11am to 3pm. The Food Let’s start with the eggs! Breakfast at Tiffany’s ($16) really is Chillax’s take on the infamous Eggs Benedict. One key differentiator at Chillax is the owner’s persistence to make every mains with a slight twist; and for their Eggs Ben, the usual Hollandaise sauce has Yuzu added to it! Not too bad a twist, making this rather “boring” brunch selection a tad more refreshing in its after-taste! And if you are beginning to get a little sick of brunch food like me, time for a switch to the original cafe food – Burgers! Steak and Eggs ($19) combines the Aussie grain-fed Sirloin Steak with a sunny side up. Quite decent an option here, considering the rather affordable price tag for some meats to down together with your beers! 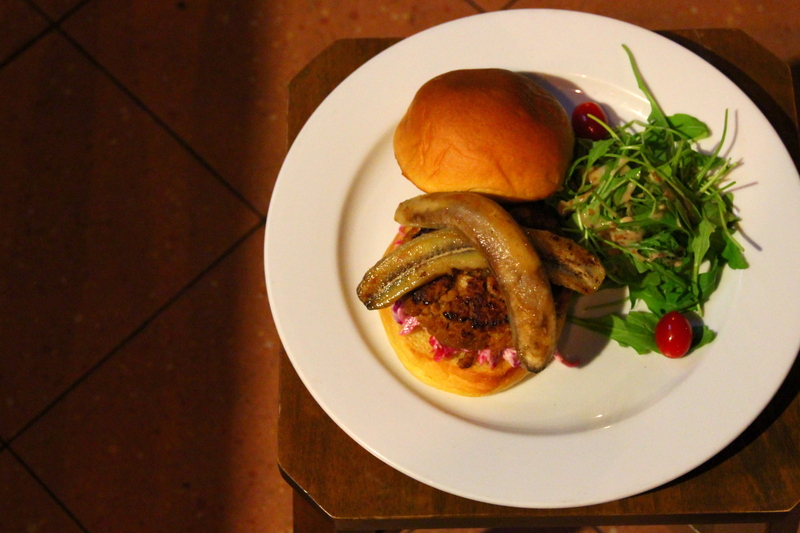 The Marmite Pork Burger ($17) has got the punch to it with their caramelised bananas and purple slaw. The pork patty on its own will taste a tad too salty, so just make sure you have it with the rest of the compliments – unless you like your burger salty la! Have never really been a fan of alcohol-poached fruits, until this. Red Wine Poached Pears and Granola Crumble ($10) went really well with the Vanilla ice cream. Probably a good substitute from one of the usual bar snacks between drinks. The kids have their Milo Dinosaur. The adults, well, they can have their The Adult Milo Godzilla ($15)! Looking harmless on the outside, this potent drink mixes Vodka and Milo into one sinful late night drink. I thought it would have tasted weird, but it did hit some of the right notes. Probably the best disguise if you needed some “drinks”, yet dining with your family at Chillax, now you know what to order! Not a big fan of Bloody Mary, so this OTT Bloody Mary ($18) wasn’t something I am going to go gaga about – so you have to be your own judge unfortunately. From the small talk around the table, this seemed like a pretty decent mix, so try it if you fancy. Rants It’s Serangoon Gardens. So getting a car park lot is probably as tough as striking the lottery. And at Chillax Cafe, shall we do up the place with a little more lights; we do feel better seeing what we are eating, don’t we? Will I return again? There are no lack of food options in the Gardens, with Chillax promising you a more relax and casual environment. But it might take more to make me return to Chillax. While it offers everything, from brunch in the afternoon to drinks and bar snacks at night, we feel that Chillax can do better with some strong signature mains/desserts like their other sister restaurant – Babette.